Pulguito is all better now (we hope), but we think he had slap face measles/fifth disease. The thing with this measles is that he’s contagious before the cheeks turn red, so you don’t know that you are infecting people. Once the cheeks turn red, you’re not contagious any more. Hopefully, this is what was keeping him up at night. So he didn’t get to go to swmming lessons last night. Instead, Robert took him out for a drive while I got Chunguita ready to go swimming. She’s doing really well. They have her “swimming” with a kickboard all the way across the pool. She’s having problems turning her head which is ascerbated by her hair getting in her eyes and nose and mouth. I forgot to put her hair up. The weekend was very busy, so I didn’t have any computer time. Thanksgiving was a lot of work. Between cooking and watching the kids, Robert and I were exhausted. Mom is doing much better. 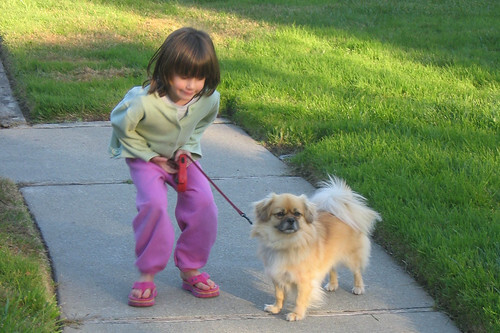 She is walking around just fine, altho she didn’t think she had enough energy to go to the park with Dad, Robert, and the kids. She did fine the entire day, and I wouldn’t have known she had been sick except that she decided to sit while I cleaned up. Usually, she will stand with me in the kitchen. Dad seems much improved, too. I think he was really scared that he was going to lose her. Robert took Chunguita to see the SpongeBob movie, and she made it all the way thru. It was her first movie. She’s going to see the Incredibles on Saturday for a birthday party. We’ll see how she does. Instead of working on the various projects that I have cut out and ready to go, I decided to alter patterns. The jean jacket was a learning experience. The front of the jacket has a yoke above the breasts and 3 panels running vertically from the yoke to the waist. I think the middle panel should be centered over the apex of the breast, so that defined my alteration, but I couldn’t figure this out without first pinning the pieces together and doing a regular full bust alteration (FBA) on the 4 pieces pinned together. So instead of princess seams, I attacked the alteration like it was for a top with 2 vertical waist darts. I pinned the pieces together and traced them (again!) as one big pattern piece. I worked thru the alteration without giving it any thought, just like always. 🙂 When I pinned it back on Buttina, the center panel was indeed centered on the apex, and I was able to see that what I needed was a princess seam side adjustment that could be done entirely in the side-front piece. It wasn’t like it was obvious at that point. I had to study FFRP several times before I had it figured out. When I pinned the final version onto Buttina, it looked pretty good. We shall see. I also worked on Neue Mode 23135 and Neue Mode 23061. Both were a very simple affair after the jean jacket. I won’t be able to work on them for a while. I participate in a gift exchange every year on my moms’ e-mail list, and I signed up to make a bag for one of the moms. 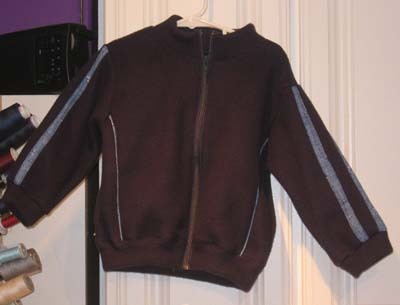 A jogging jacket for toddlers with princess seam style piping and sleeve stripes. I made a 98 which corresponds to a child’s height of 98 cm. My son is a slender 96 cm boy, and the jacket is a bit big on him. Mostly. I used a thicker fleece for the jacket and the neckband, waistband, and cuffs, and I left off the embroidery. So it’s bulkier than the one pictured. Yes. Ottobre provides good instructions. DISLIKE: I like to use self fabric for cuffs and such, so I used the fleece. The pattern calls for ribbing for these parts, and because I always have a hard time finding coordinating ribbing, I don’t use it that often So the cuff, in particular, was tough to put in. I would like to see patterns use self fabric more often. I don’t want to have a stash of ribbing as well as all the fashion fabric. LIKE: It’s so cute, and it really comes out well. The details of the piping and sleeve stripes add so much to the jacket. DISLIKE: The fabric requirements are excessive. I got this out of a 1/2 yard of 60″ fabric with fabric to spare, and I think the pattern called for 5/8 of a yard or more. Cheap fleece from Joanns. It was double thick and leftover from a sweatshirt for DH. I used some blue cotton jersey for the piping and stripes. It was a lightweight knit. I use self fabric for the bands and cuffs instead of ribbing. I might make him another out of the windpro when I make my husband’s next sweatshirt, but DS’ll be too big for it soon. It’s so cute, tho. Maybe I’ll make it as a gift for other children. It’s so cute. It’s so cute. Did I say that already? My eyes are smarting from the onions, so I’m taking a break from cooking. Things have gone better since the nuts. Of course, it doesn’t take a genius to boil potatoes or microwave yams. The turkey is in the oven, and the bread is baking. I hope all you Yanks are having a great Thanksgiving! I went home early yesterday to make some glazed peacans for Thanksgiving. The recipe said it only took 15 minutes to make them. NOT! Maybe if the cook were someone who had a clue about cooking. I think I used a pan that was too big. The sugar never melted; either nothing happened or it burned. I finally dumped the peacans in the gloopy mess and stirred it up. They look like crap, but they are very, very tasty. So as far as I’m concerned, it’s a winner. Taste is what it’s all about. Because the nuts took so long, I only had about 10 minutes to sew before making dinner. Actually, I sewed while I boiled water. The inner legs are attached to Kwik Sew 2529 and topstitched/coverstitched. After everyone went to bed, I rethreaded the serger to overlock and pinned one side to the crotchpiece. I can’t run the serger at night; it wakes up DH. I also pinned in one of the french darts on Kwik Sew 2565. Maybe I will finish my t-shirt by the end of November. Clothes: Blue twill pull-on pants, white mock turtleneck shortsleeve sweater, black motorcycle boots, upsidedown jean jacket. Notes: Clothes needed to be easy to change into/out of for yoga class. Still have my period, too. I worked a little on Kwik Sew 2529, serged the inner leg to the crotch piece and topstitched/coverstitched on seam. At this rate, it will be next summer before I’m finished with this garment. I think I should have picked a fabric that I’m more excited about for the plus sized t-shirt sewalong. I’m just not motivated to work on it.